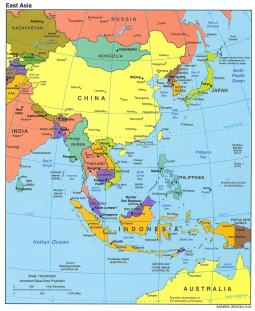 The Republic of China invited only the Soviet Union to enter its territory to wage war against Japan. The Soviets, without legal authority to do so, invited the Mongolian People’s Republic (MPR) to fight alongside them. In one sense, MPR participation in the war against fascist Japan was natural, for the MPR had stood steadfastly with the Soviet Union on both western and eastern fronts. Yet, it is also accurate to describe the MPR’s purpose in joining the ‘Liberation War’ as not just to defeat fascist Japan, but also to incorporate Inner Mongolia into the MPR. Moreover it was intended as a show of force compelling the Chinese government to recognize MPR independence. These purposes were clear from the day the MPR declared war and, from China’s perspective, they were unwelcome. Following the Japanese announcement of surrender, the KMT, CCP, MPR and Soviet armies all raced to control as much land as possible. Their efforts were shaped by General Order No. 1, which ordered Japan to surrender directly to the Soviet Union in Manchuria and to the Republic of China in the rest of China. This order excluded both the MPR and the CCP. In addition to territory, control of prisoners of war was also an issue. The Soviet Union and the MPR saw Japanese POWs as a useful source of labour. On 21 September, MPR soldiers entered Jehol [Rehe] and captured over 2,000 surrendered Japanese soldiers and confiscated their weapons ‘in violation of international convention’. 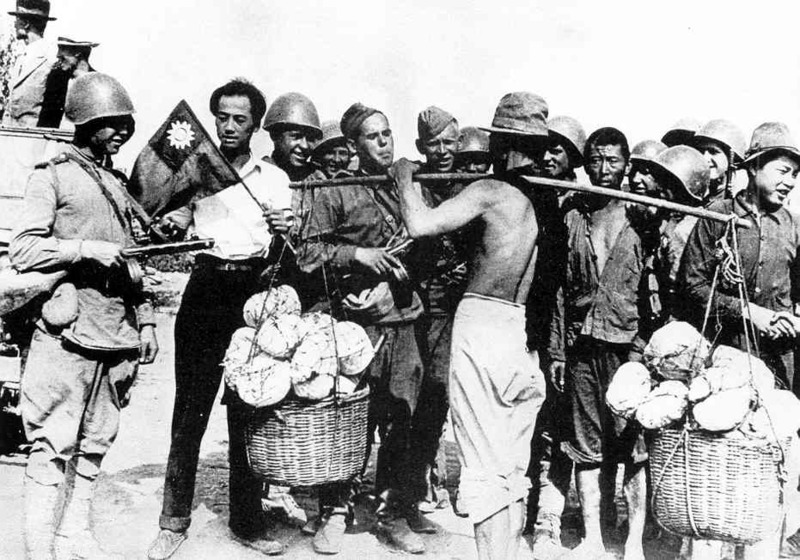 Between 23 November and 10 December, 12,318 Japanese POWs were brought to Mongolia. 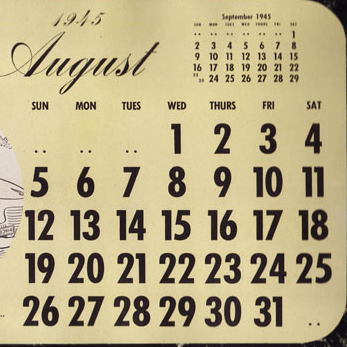 These soldiers stayed in Ulaanbaatar until mid-October 1947. 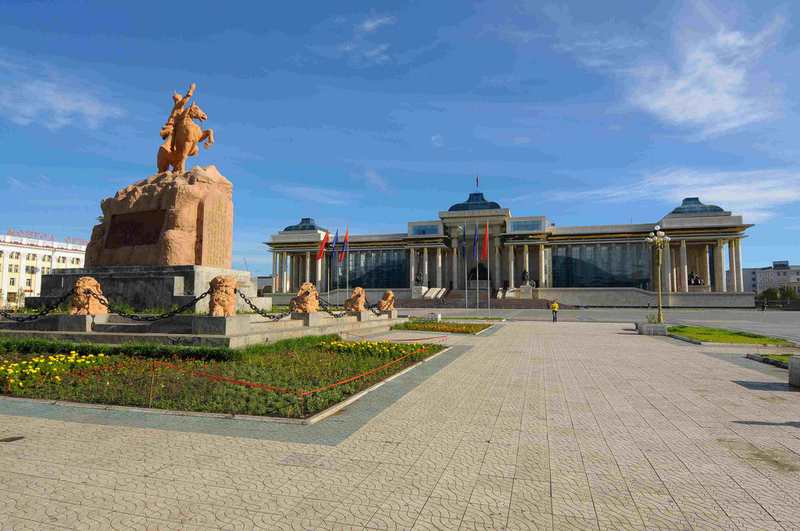 They helped build the Government Building, Sukhbaatar Square, the Ministry of Foreign Affairs Building, the National University of Mongolia, and many other buildings which still stand today as representatives of Soviet era architecture. In addition to these Japanese POWs, less known were hundreds of Inner Mongolian POWs. They were former soldiers of Manchukuo or the Mongolian Autonomous State. Without discrimination, these soldiers were arrested as POWs and brought into Mongolia, many spending 4–5 years in prison before they were released and granted MPR citizenship. Unlike those who entered into Mongolia in groups, such as the Ujemchin Mongols from Shilinggol and Barga Mongols from Hulunbuir, these Inner Mongolian POWs were treated harshly. Due to the intra-Mongol morality for not washing the dirty linen in public, their suffering in Mongolia has never been studied in depth. 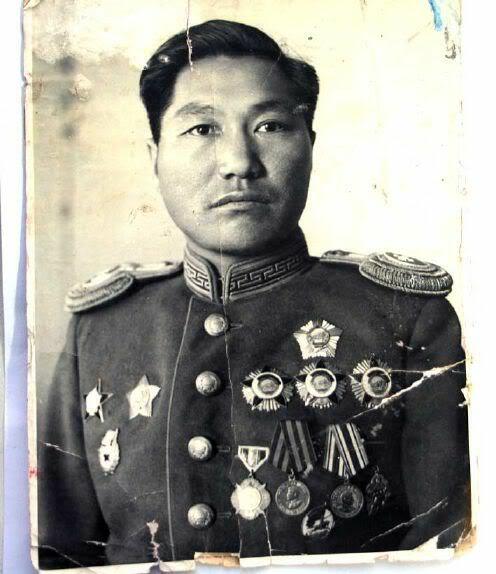 It remains a mystery as to what the pan-Mongol-oriented MPR leadership intended to achieve by punishing those Inner Mongol youths who put down their weapons and enthusiastically welcomed the MPR forces as liberators. What did Mongolia gain from this war? From the Chinese government perspective, MPR participation was uninvited and was thus ‘illegal’. And yet, at a time when world order was maintained through force, Mongolia’s biggest trophy in its uninvited war against Japan was its own independence. 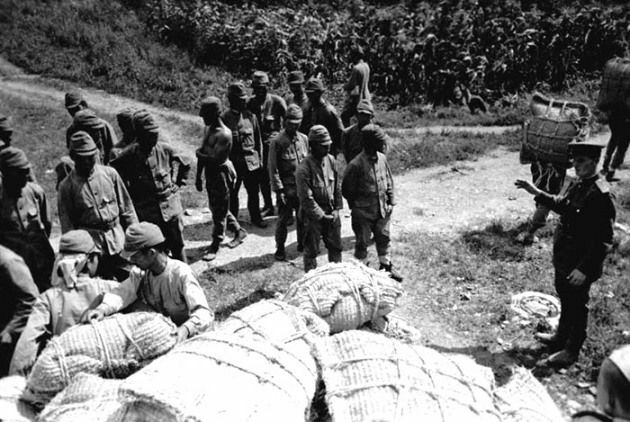 The ‘illegal’ capture of the Japanese POWs, whose forced labour helped to rebuild Ulaanbaatar, also helped to foster Japanese friendship; the Japanese POWs were treated with respect. This achievement may eventually compensate for the loss of Inner Mongolia. 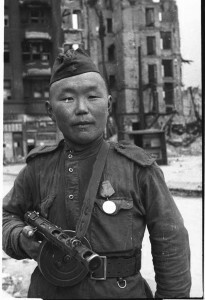 A Mongolian soldier assisting the Soviet army during the battle for Berlin. The Endangered Archives program at the British Library has an excellent collection of Mongolian-Soviet photographs from Europe. Unsurprisingly, Soviet news agencies like TASS show Red Army troops receiving a warm welcome from locals in Manchuria. The reality was more nuanced.